How can I uninstall Comment Mail but keep my data? If you leave Data Safeguards enabled, deleting the Comment Mail plugin does not erase any of the settings from the WordPress database and when you reinstall Comment Mail, those existing options in the database will be used and your previous configuration will be restored. This also applies to Subscription data—when Data Safeguards are enabled, Comment Mail will keep the Subscription data in the database. If you're using Comment Mail Pro, you can export your Comment Mail options from WordPress Dashboard → Comment Mail → Config. 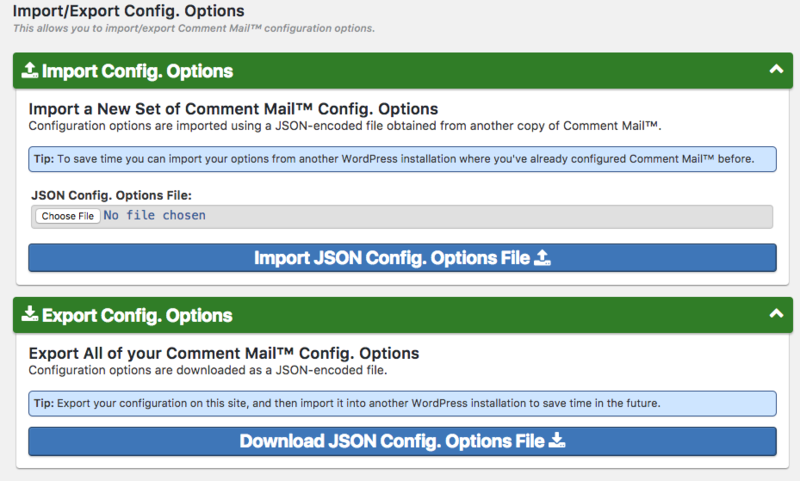 Options → Import/Export Options and then reimport those options later (either after reinstalling Comment Mail or even on another WordPress site).